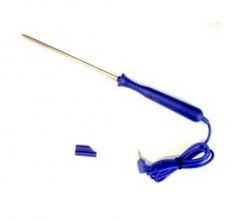 EcoTemp Thermometer Replacement Penetration Temperature Probe. This plug-mounted, stainless steel penetration temperature probe is a direct replacement for the original EcoTemp probe supplied with your thermometer. If you have lost the original probe, or simply need a spare, this provides a low-cost replacement of the original probe, for use specifically with the ETI EcoTemp thermometer. Provides easy, rapid and accurate temperature measurement for the EcoTemp thermometer. Beholder med 180 stk antibakterielle sprit-klude.